This will be my first time posting a tutorial. I have been reading on some of the list about Snap Bags and I thought I would post how I made one. 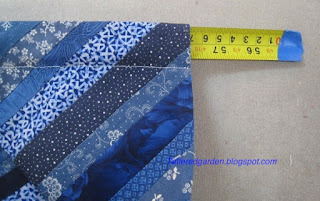 You will need two - 8 1/2 inch square Scrappy blocks or a piece of fabric 8 1/2 by 16 1/2. 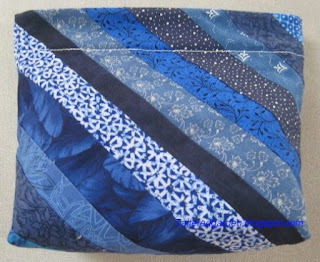 I didn't use interfacing or batting in my bag because the strips were already so thick - but you could if you wanted to! 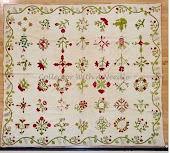 A piece of Lining 8 1/2 by 16 1/2 inches. than the width of the finished bag. Round off the sharp corners and cover with tape.. This will keep the metal from poking through the fabric. 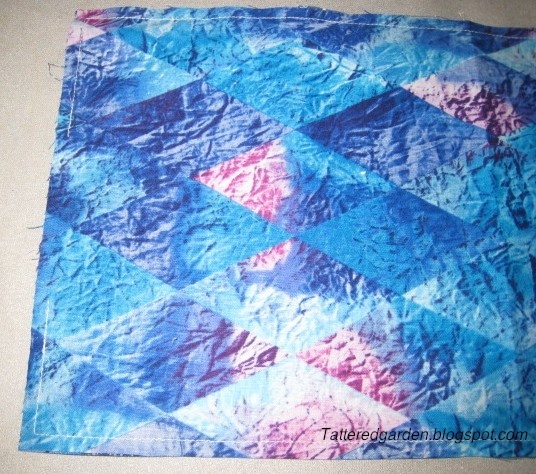 First you want to sew the two blocks together. I used a 1/4 inch seam. Then pin the blocks to the lining - placing the right sides together. Sew all around the bag leaving an opening for turning on one of the short ends. Trim the corners and turn the bag right side out..
Press well and turn down 1 1/4" on both short ends. Stitch across the 1 1/4 inch you turned down. Leave the ends open. You may want to use thread that matches your fabric. I used white so it would show up in the picture. Now you need to insert the metal tape. Make sure the numbers face the right side of the bag. If you don't put the tape in right you won't get the snap that closes your bag. Put a piece of tape in both ends of the bag. Make sure the tape is 1/2 inch shorter than the bag on each end. 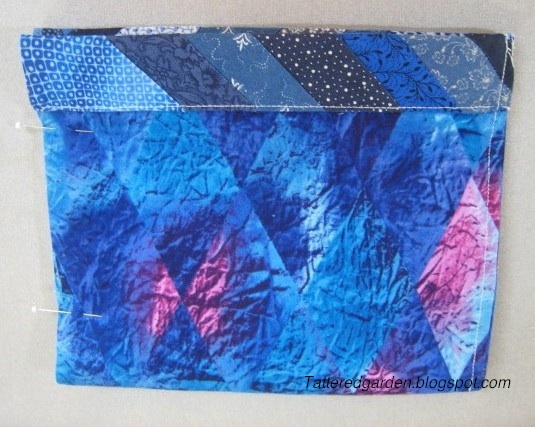 You don't want to sew over it when you sew the sides of the bag together. With right sides together sew the sides of the bag. I find it easier to start sewing from the bottom of the bag. After the sides are sewn together you make the bottom. To do this make a mark about 1 inch up from the bottom on both sides. Center the bottom of the bag over the side seam and stitch across both ends where you made the mark. Turn right side out and you are finished! 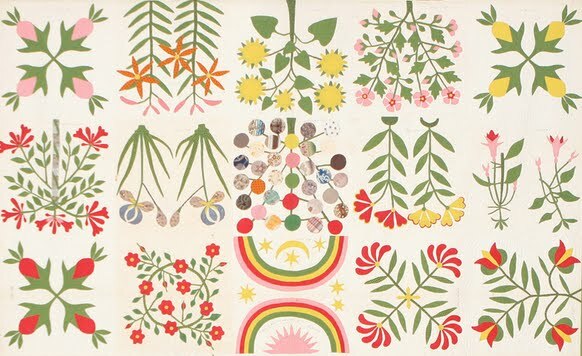 There are many things you could do with this simple pattern. You could add batting or interfacing to make the bag have more body. I have seen them made with beads or tabs to help pull them open. They could also be made smaller or larger. All instructions are written with the best intent and are only a personal account of the sewing of my bag. I hope the instructions are not too confusing. If you do have problems be sure to let me know. I would be glad to answer any questions you might have. 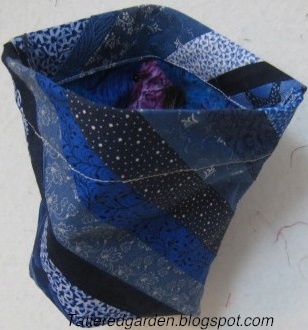 If you use my tutorial to make a bag I would love to see the pictures and please give me credit for the instructions. Wow, Nancy! Thanks so much for posting this. As I read through the Stashbuster posts about these, I was disheartened that I had to buy the pattern. I knew I could eventually figure it out, but you did all that for me (us)! I sooo appreciate you taking the time to do this. I don't know that I would have figured out the metal tape measure, tho! If I remember the photo, there was a small, pointed tab to grap and open it. A large button or piece of costume jewelry sewn there would work, too, wouldn't it? You have great instructions for this snappy bag. I had never seen one before. Thanks for the step by step pictures! A project and a tutorial. Terrific. I made one in a very small amount of time. Your directions were very clear. My husband has a few of those old tape measures. Thank you for taking the time to make the tutorial. Great idea and great tutorial...thank you. I will have to try this. That is a very cool idea, Thank You. Thanks. My hubby just asked for small bag for phone charger and directions; perfect. I also saved an old tape measure! Now to find and get made. You did a fantastic job with your tutorial. I love to make scrappy strip blocks and will have to try a snap bag. Thanks for the fantastic tutorial Nancy!!! You did an awesome job and what a great use of scrap blocks and recycling old tape measures!! Nancy, this is one of the easiest tutorials I have read. Great job. I found tape measures at one of the Dollar stores for $1 since we didn't have any spares sitting around. This tutorial is awesome!!! Using the tape measure is such a great idea...could be a Tool Time Tuesday. Would it be ok if I linked back to your blog and show everyone? Excellent tutorial! Who would know you were a first timer? Gotta try this! Thanks so much. For the first time posting a tutorial, you did a great job. Very well written and the pics help tremendously. Oh you are so clever, congrats on this, The whole thing could be made from recycled things, I Like this idea a lot ! I am going on a cruise this summer and need a lightweight bag to carry with me at all times with my chapstick, contact eyedrops, glasses, etc. This would be great but I need a long strap so that I could sling it over my head and across the body and not have to worry about it. When in the process and where on the purse would you suggest adding a strap. maybe sew your strap into the side seams just below the snap/tape.. that way it could be stored inside when not needed.. and you could use as needed..
sew it so that the strap would be at very edge of the snap/tape when in use.. so bag could still close easily..
havent made one of these before, but looks like it gets added to the - to do - pile..
A friend got me several of the carpenter's tape measures. Most are 1". Can this size be used? You didn't say what width tape measure. Wow, Nancy you are so talented. All your scrap quilts are just great. Your AMG and the Florabunda blocks are stunning. I have done 5 of the AMG and am collecting the Florabunda blocks. You do rug hooking. I have the tools but have not started yet. Super tutorial. I also love your blog, and will be following your posts. my sweet sister made me one of these and she wanted me to guess what made the "snap"- I thought it was a slat from a mini blind...... anybody think this would work? That seems like a great idea and will be having a go with it - before I suggest my group of elderly people who need extra care have a go at it. The Group is know as the Arts, Crafts and Laughter group (I added the Laughter part as its so important!!) Thanks for this idea and I will let you know how it turns out. 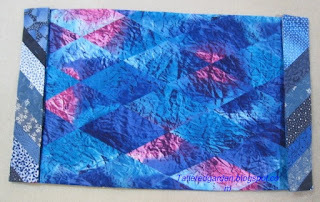 I have been reading all sorts of quilting forums and no one ever TELLS you what this is..Thank you so very much for clarifying it and making this wonderful tutorial. My nieces will love these. I don't think that a slat from a mini blind would work. A tape measure is made to snap back to straight after being rolled up within the casing. A mini blind slat would probably just bend and/or crack without that built-in "snap back" capability. You can use any width tape measure, but just make sure it's sturdy. Some use thinner metal than others so their ability to snap back isn't as strong. I've also heard you can double or triple the thickness (stacked on top of each other) of the lengths of tape measure if you want to compensate for a flimsier one. I just made 2 of these for gifts and they were very well received. What a clever idea! Hi good day ! nice post you have . It's very nice , I have plan to setting up my garden can you give me an idea or steps on how to make it beautiful. i have heard some garden accessories such as garden spinners , wind chimes , wind spinners and many more . I want to try this things in my garden but i don't know how to get the right accessories . I hope you can help me . thank you . This looks great and easy! Thank you! Janet from "A Hug Delights" sent me your way. What do you use to keep the tape from rolling back into the container after cutting? Again, thank you for the tutorial! Thank you so much for this tutorial. You did an awesome job!!! I bought the pattern but the instructions were lousy. I am a visual learner and you helped me to see exactly what to do. Now I can get back to making my bag. Thanks again. What a clever bag. 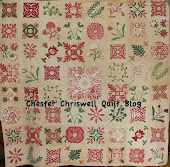 I love it and am so glad you shared it on Sew Darn Crafty! Visiting from the Sew Darn Crafty Party. What a clever idea. We have a bunch of broken tape measures that could be used for this. Thanks for sharing. Thank you for really explaining the tape part. I finally get it, though my DH just looked at me and said I should have asked him...LOL. I am very glad I found you! I read about you on the Cute Embroidery List. Thank you so much for taking the time to tutor souls like me who just need to be shown. What a great way to use up extra quilt blocks, and trial embroideries and create something you can really use and something other people really want. Nifty tutorial. Do you think my husband would notice a chunk out of his tape measure? I must give this a go. Sandy said.......Thanks your tutorial made this a quick & easy pattern! Thanks for taking the time to post these directions. I have one question about the bottom of the bag...can you explain that part a little better. I get everything else. I belong to a group that crafts items to support an animal rescue group, and we were thinking of making these to hold dog treats. I'm not sure what might happen to the measuring tape if you threw it in the wash though. Anyone tried washing one of these bags? Nancy this is exactly what I have been looking for. I have been making draw string bags for missionary work so this is one great way of using up all my hubby's old tapes and a quicker way to finish the bags as I was running out of ribbon for my draw string. Many thanks for your splendid tut. I like how you did this bag so that there is no visible inside seam when you open the bag up . . . I wanted to make a bag like this without seeing the top seam! Thanks! My daugther is making one of these and her mother doesn't sew at all. We are wondering how you do it if you add the batting? "A New Direction in Quilting"